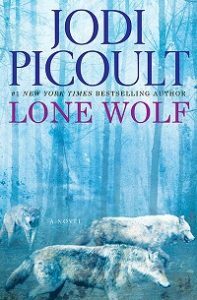 “Jodi Picoult‘s books are hit or miss for me. I’ve loved some of them, and felt “meh” about others. So when Ramona recommended Lone Wolf, it sat on my shelf. And sat on my shelf. And sat on my shelf. I usually try to get to book recommendations fairly quickly, but when there’s 3,987 books on your TBR pile, sometimes quickly is relative. Based on the back cover copy, I wouldn’t have chosen to read this book on my own. It’s all very vague and sounds like standard fare: family secrets and conflict. So when I started reading, I was pleasantly surprised by just how engaging it was. Luke Warren is an expert on wolves, even living with them for a period of time. When he’s in a car accident, in a vegetative state, his estranged son Edward and his minor daughter Cara, fight over who gets to decide if he’ll stay on life support or not. I love books that present moral dilemmas, and this one was a doozy. Through Edward and Cara (as well as through Luke’s point of view in flashback), the reader is presented different opinions. I loved the way multiple people saw the same person so differently. 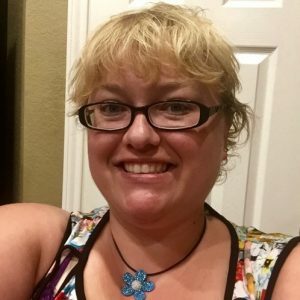 The Read Harder Challenge has been a place for me to branch out with my reading comfort zone, mostly to my pleasant surprise. Ramona is something of a guru to me, she is smart, brave, fierce, caring, sensitive, and really works on being her best self. I knew she would be my go-to for the challenge category of: A Self Help book. I consider myself happy and satisfied with my life and I would be lying if I said I hadn’t placed some judgement on people who keep needing books to make them happier or tell them how to be fulfilled (I realize as an avid reader this may seem incongruous). Up until Read Harder challenges in the previous two and half years I read for pure pleasure and I still do for the most part. Pleasure reading for me was a lot of thrillers, chick lit, a lot of literary fiction, and begrudgingly a memoir or two for my on again off again book (wine) club at the time. 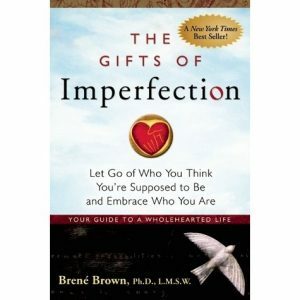 Ramona suggested The Gifts of Imperfection: Let Go of Who You Think You’re Supposed to Be and Embrace Who You Are by Brene Brown. I read this book on my kindle in two days and it got a rare 5 Star review on my Goodreads. I perused my review and my highlighted passages in preparation for this post and I still feel the same way. The title alone was an aha moment. It literally changed how I looked at my life! As a Mother, this book taught me so much more than I can state here, but the main impact was, if I am always striving to be the “perfect” mom, wife, and human, then I will miss out on so many little things. I could also be teaching my kids that perfection is the only acceptable version the world can see from them. The idea of perfection itself is so abstract and personal to everyone, it is really impossible to be a perfect person; we are all setting ourselves up to fail! By accepting and enforcing boundaries on my time and energy I could recharge myself and let go of resentments and anger. I still struggle with the letting go and let’s face it, the anger BUT I have stopped comparing myself to those “put together crafty moms” because now I realize that they too are probably barely holding it together! Thanks Ramona for always knowing what I need and teaching me to be open enough to accept the suggestions.